Hooked on Houses is hosting her "Hooked on Friday's" blog party: today I'm hooked learning about New Urbanism. For most of us who live in car dependant suburban areas, some of these ideas are difficult but very intriguing. For me it's 2 simple ideas: will I have to move from this place I love when I'm no longer able or interested in driving; will I live in a cool enough place that my children and grandchildren will want to live nearby? I've collected some of the catch phrases and buzzwords a few paragraphs down. Andrés Duany is a founding principal of Duany Plater-Zyberk & Company (DPZ) the planners who did Seaside. The Atlanta Regional Commission hired him to organize a charrette this winter. 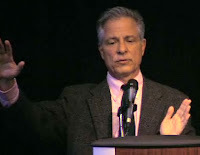 It's all more than I can explain but in the course of the event Mr. Duany gave 2 talks that you can watch on the web. There are 2 great things about the talks for me. First Mr. Duany is the premier "explainer" of new urbanism. Second, he talks specifically about Atlanta where I've lived for 40 years. Now each talk lasts about an hour. If you are an Atlantan you should watch. Here is they are. But I'm going to save you some time. Everybody thinks that developers always had a bad name. Developers are like the most embarrassing thing you can have as a dad for example. That wasn't always so. Can a young person now be stolen from you - young talent - by a cooler city? You can build the most beautiful park in the world and if the edges are dead, the park is dead and unsafe. The trick of designing open space is what's around it. (Malls are) spaceship landings surrounded by parking. Millennials - Grew up in the suburbs and for them the suburbs have no magic. They did the mall, they did the cul-de-sac and they love cities. "Drive 'til you qualify" for a home loan - current model or affordable home ownership. Instant Urbanism, Faux Urbanism. Seaside, Disneyworld, Atlantic Station, Glenwood Park. A criticism. "real" urbanism take time. Ms. Dunham-Jones says that some of the best of "old urabanism" was built over a very brief period. Flexibility of the Grid - New York's grid has worked for everything, every density, and every period. It's the most flexible design. Fist Fights over Everything. It's very hard. Leap Frogging. Most "inner" suburbs and malls have been leap frogged by more distant suburbs and malls. The more distant ones get leapfrogged again. Most inner suburbs decline. Now the inner suburbs are more central and (denser, closer to transportation) ripe for retrofitting. In Atlanta think North Lake (still in decent shape), Gwinnet Place, then Mall of Georgia. The suburbs dominate job growth. You are invited: Epic Design Event, April 29, 2009!!!!! 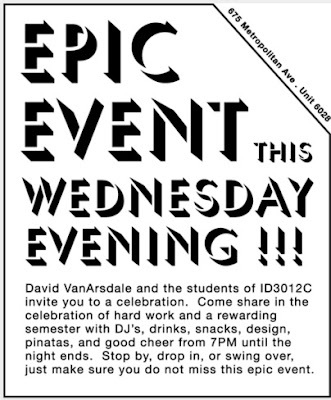 Here are the details for the Ga Tech ID3012C Epic Design Event with David VanArsdale. Last Thursday I blogged about David VanArdale's class and their ATL to NYC road trip to New York to visit industrial design houses. When we last left them, the class has just begun their 4 final team projects. They weren't planning to sleep very much until they were done. If we've learned anything it's that the are blogging it all. Here are the team blogs. Thanks to ID 3012c and Bartender group student, Kim Bryant, for letting us know. Kim Bryant getting it done. Know Stewart Brand? He's the Whole Earth Catalog guy. I have a copy and remain in awe of it. Mr. Brand also wrote a book and produced a TV program, How Buildings Learn. It's about buildings that are adaptable for human needs. It strikes a chord with me: the best homes will meet the needs of many generations of many families. Bigger building should do the same. Now, he's put the 6 TV programs in the public domain. If you enjoy architecture, buildings, design, people, and human ingenuity as much as I do, you'll want to watch all 6 episodes, which I will post in the next few days. Here is Episode 1. "Flow"
See the slide show (bottom of the post) for more pictures. Ever seen a carved crayon? Here is one by Diem Chau, at Kraus Gallery, more below. Update: Jef Bredemeir wrote in with some more carved crayons by Pete Goldlust. Our first stop was Studio Clout - Fine Art Gallery. Studio Clout was hosting the Senior Art Show for Spelman College art majors. The wonderful artists were all there. Have you ever met a Spelman woman? If you do, you are in for a treat. They are extraordinary. Sorry I didn't get pictures. Clout is a very nice gallery though, perfect for the event. Next we visited Castleberry Point Lofts. for wine tasting. The wine shop will open in May. Here are our hosts, owners Nora and Shannon Wiley. The wine shop's name is still secret. Keep your ears open. I'll bet they'll have another tasting. We ran into Liliana (left) who grew up with my children. She was taking pictures for Loft Life Magazine. We met Tod Ban who built the spectacular wine bottle racks. Next we headed to Besharat Gallery. Amazing art, amazing space, you should just go. Really, just go. Here is Massoud Besharat himself with Architecture Tourists. Here I am at Besharat with a new acquaintance. We ran into another friend at Besharat, Atlanta painter and cartoonist Tom Ferguson. Tom came to Atlanta to restore the Atlanta Cyclorama. Next, the Granite Room which was hosting an exhibition by the Atlanta non-profit, APE: Atlanta Photography Exhibit. Many photographers, many affordable photographs. Lots to see. Thanks to Matthew Wilder (orange shirt) one of the APE directors explained what was going on. Reginald (Reggie) Gillumo was across the street. I'm wish I'd taken more pictures, there is one more in the slideshow. He's a dymano. But by now our art stroll injuries were catching up to us. Injuries or not, we soldiered on to Cartel Studios. to see this work by Jason Scott Kofke. And to the Krause Gallery home of carved crayons. Here are more carved crayons by Diem Chau. You have to get close. We met the Mad Man (white T-Shirt) about whom we know little except that this painting is one of his favorites, he has a nice smile, and clean T-Shirt! He was upstairs from Krause Gallery. By now the Architecture Tourists were bloodied, blistered, and a bit wawm (perspiring). We hadn't seen it all but we needed to save our strength for other strolls. We made the turn for home at amazing Peters Street / Walker Street corner and headed for home. On the way back we met Tiger Stiles, the very friendly and entrepreneurial proprietor of Swagg House Studio, 294 Walker Street Atlanta, GA 30313. The Architecture Tourists were more than happy to help with promotion. Call 877.677.9244 to talk about free studio time. Here is the whole slide show with even more pictures. Check it out in full screen. Hooked on Houses is hosting her "Hooked on Friday's" blog party: today I'm hooked on ID students. "12 industrial design students from Georgia Tech go for the reality check of a lifetime in a four day immersive adventure to the big apple." They are junior industrial design students in ID3012C Intermediate Design II. I want to tell you a bit about industrial design at Georgia Tech, the hardworking design students, and a remarkable teacher. I hope you'll go right to their website, "ATLtoNYC.com" and donate some money to them. Want to hear a bit of the story first? One of the great things about Pecha Kucha is finding out about folks like David. Here he is presenting his 20 slides in 400 seconds. David and his ID3012C class did it all. The arranged the visits via industry connections, former Tech students and others. They designed the logo, the bags, the T-shirts, the vinyl sticker. They raised the money from sponsors, donations, yard work, and Boston butts. The made the marathon trip. They live blogged it all. They visited a bunch of design houses. I'd never heard of any of them (I don't get out much) but now I have. Here they are at Nulux. karim rashid didn't allow studio visits but he is BIG and designs just about everything! Has a fun musical website. Rockwell Architecture, Planning and Design, P.C among other things, they do set designs for Broadway plays and sets for the 81st Academy Awards. Curve ID NIke watches and John Deere tractors! Smart Design Taxi graphics, hospital scrubs, sink strainers, toothbrushes. Crush + Lovely Can't figure out what they do but it's fun trying. Core77.com is the "magazine" for industrial design. So what do they teach in Industrial Design at Georgia Tech? Here is the undergraduate curriculum. I guess this may look familiar to some readers. What I notice is that they have to take Calculus and Physics!!! As a Tech Grad, let me tell you, Georgia Tech is hard. Calculus and Physics at Georgia Tech are "real hard." The students are blogging it. 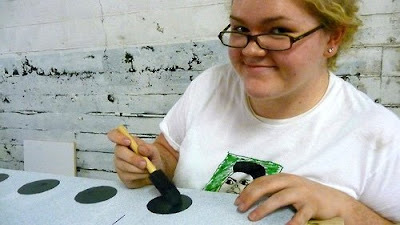 Want to know what today's design students are up to? Here are their blogs. I'm sure they'd enjoy your comments. Right now they are working on their final projects. "Four teams designing four workspaces. A barber, a banker, a bartender, and a barista!" Last but not least, David VanArsdale visiting instructor, Industrial Design Program, Georgia Tech. He did much more than he had to. His students will never forget. I salute him. Returning you to Hooked on Houses' "Hooked on Friday's"
What a great night: dinner at the Varsity followed by Atlanta Pecha Kucha Night at Octane. Here we are, Rachel, Katherine, Elizabeth, and Terry with our "V" cups. And Tom Lynch, our next door neighbor, was there too. Who knew? We made a couple of new friends, trading cameras. Saira Khan - Dearer than the Heavens . . .
Find out more about ATL to NYC. They replaced the old Trust Company Building while I was at Georgia Tech. I never saw it in person. In 1973 I began my career across the street from the new building. So I saw these every work day for 10 years. Last week I took a few pictures. Here are 3 of the old columns. This is the Edgewood facade of the old Trust Company. Here is the indoor display. Just go into the banking lobby and look right. This used to be a public concourse between the old banking floor and elevators. It was very grand. Now it's a small cubicle farm for employees only. I asked the receptionist who kindly let me see them up close and take some pictures. The carving isn't what you'd call crisp. I'm sure there is a name for the style but I don't know it. It's as if it has weathered for 2,000 years. If we could see through this window we'd see the indoor sculptures. The reflection shows the white Healey Building. The Skyscraper is the Equitable Building. This is the Pryor Street facade. Here is your host in my baggy khakis. When I worked downtown in the 1970's and early 1980's many of the bigger buildings had great cafeterias. The Hurt Building, the First National Bank Building, the Equitable Building all had busy cafeterias within 2 blocks of each other. The Trust Company had a one of the best on the 12th floor facing north. That's not all that long ago, is it? They've saved some columns from the old Equitable Building too. The old Trust Company and Equitable building are just a block from each other. Modern buildings took their place. Both old buildings might have been rotten, unsuitable for modern use. But I don't think we'd tear them down today. The wonderful Grant, Healey, Flat Iron, Chandler, and Hurt buildings are still there and still classy.